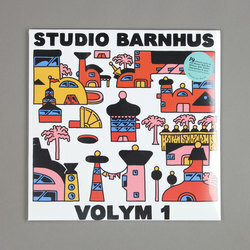 Various Artists - Studio Barnhus Volym 1. Vinyl LP, CD. Bleep. Studio Barnhus showcases the best it has to offer with this 19-track compilation. The artists featured on Volym 1 range from old friends to new faces. This being a Barnhus compilation there is a warm Balearic quality to many of the tracks, but the manner in which the artists approach the brief varies wildly. For every party tune there is an ambient soundscape, for every DJ tool a weird … thing like DJ Koze’s ‘Hawaiian Souldier’. Label bosses Axel Boman, Petter Nordkvist and Kornel Kovacs all turn in new material here too - the highlights from their selections are the rolling deepness of Kovacs’ ‘On Roofs’ and the Boman/Miljon collaboration ‘Forgot About You (Piano Version)’.